Paddle along the river. Try to find the rhythm. Use a and d or the arrow keys to move left and right. Use the pulsing moon to guide your rhythm. If you move in time to the music, it will gradually build, with new layers being introduced as you go. Turning for longer will give you more force. And will allow you to hear the music correctly. The two main difficulties I had was understanding that I had to hold the keys, and that I could not press consecutively the same key twice). Once that assimilated, it was a really pleasant experience! The music evolving through progress was really enjoyable! And the mechanics itself felt forgiving enough to me. The visuals are also really cool (even though it's weird to see chunks of the river appear at the last second). Good job! It's very kind of you to take the time to go through every single game, I hope you had fun! I did, I always like to give feedback =D It's important for growth, especially if you can try to find something productive to say! I'm kind of torn on this one. I think you'll see in the video, as I started to progress and the layering started to happen, I got a huge smile on my face, which instantly and irrevocably melted away with trying to manage the boat and rhythm together. It just seemed overly difficult for how chill and relaxing the atmosphere was. It was really frustrating having to go back to the beginning of the song ever time I missed a beat or tried to help correct my boat. I would suggest an auditory cue for hitting the buttons... I'm personally not a fan of visual cues for this kind of game... That or make the visual cue more clear, like giving us additional points of reference for beats. The river too, I think could load in more soon, to give it a more seemless look! Yeah! I agree, there could be lots to explore. Thanks :) I updated it since the initial feedback, so hopefully this is a sign it has become a bit more intuitive! This was very visually appealing. The sounds were jarring, mostly due to the repetitiveness and no smooth transitions. I started trying to play it by tapping the keys in a rhythmic pattern which made it worse. Took me a bit to figure out I needed to hold the keys down. Thanks a lot. I'm working on making the mechanics clearer through visual indications, and smoother audio. Sounds were a bit annoying. 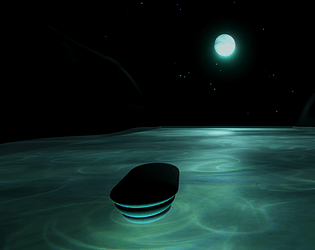 But the visuals, especially that water shader, were fantastic.